2019 dues reminder cards will be mailed out after Dec 1. You should receive your white 4×6 dues reminder card before Dec 21. If you have not, please send an email to membership to make sure we have your correct postal address on file. NOTE: A dues increase to $15/yr was voted on and approved at the July 2016 Lodge Executive Committee meeting. It was also decided that there will no longer be a different ‘on-time’ and ‘late’ fee. All dues are $15 for one year, no matter when they are paid. When must I pay my dues? The Lodge sends out reminder cards to current members when dues for the upcoming year should be paid. This typically occurs in November or December each year. Please try to send in your dues payment as soon as possible after receiving your dues reminder card, preferably before January 1. Pay online by following the link on the top of this page. You will need to know your Lodge ID# if paying online. Mail your dues reminder card to the council office with payment. If paying by check, it should be made payable to “Hawk Mountain Council, BSA”. Please include the card with your payment as we use it to match your name with the correct record in our database. Pay in person at the Council Service Center or Camp Trading Post. Bring your reminder card or you will need to know your Lodge ID# if paying at the counter. How do I pay my dues if I’m transferring from another lodge? If you are transferring in from another lodge, your transfer fee is your dues payment for our lodge. No additional fees are required. Simply include payment on the Lodge Transfer form. If you have already paid in the lodge you are transferring from, you will still need to pay a membership fee to Kittatinny Lodge. There are no mechanisms to move funds between lodges. Your Lodge ID# can be found on your current membership card, or on the mailing label of your Wolf’s Tale newsletter. If you can’t locate it, send an email to the membership committee, or call the membership chairman or adviser listed in Wolf’s Tale. The Service Center can also provide this information. How long are dues in effect? The lodge fiscal year runs from January through December. Dues are paid in advance of the year that they are in effect. Dues paid after Nov 15 will be applied to the following year. Dues Paid January 1 thru Nov 15 will be applied to the current year. I’m a new member. When must I pay dues? No matter if you took your Ordeal at the April, May or September service weekend, your dues are paid thru the end of that year as part of your Ordeal fee. You will be mailed a dues reminder card in November or December to pay your dues to continue active membership in the lodge thru the following year. When can I expect to receive my membership card after I pay my dues? If you paid online or at the Council Service Center, the information is forwarded to the membership committee to update your lodge membership record. It normally takes a week or two to get to us. We try to process cards in batches during the busy renewal period and/or at the end of each month. If it has been more than 30 days since you paid and have still not received your card, please contact the membership committee. NOTE: If you complete your Ordeal, your Brotherhood or your Vigil, at a weekend event, you will normally receive an updated membership card reflecting your new honor level at the conclusion of the event. Dues cover annual expenses the lodge incurs on behalf of it’s members. It covers the per-person fee our lodge pays to the National Order of the Arrow organization; the cost of postage for all mailings to members; printing and mailing of the lodge newsletter, Wolf’s Tale, and all other printed materials used throughout the program year; all approved expenses of the committees of the lodge; helps pay a portion of the Summer Camp Chieftain position at Summer Camp; pays the expense of the Lodge Chief to attend and represent the lodge at the National Conference (NOAC); pays for insurance for each member at activities; and a portion is given to the Council in support of the mission of the Order of the Arrow and Scouting. Dues does NOT cover the cost of Ordeal induction supplies, Brotherhood membership supplies, attendance at service weekends, fellowship feasts, section conclaves, or National Conferences (NOAC). Each of these activities has separate fees charged to the members who choose to participate in them. What does being an active member entitle me to? 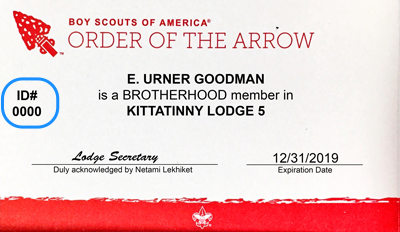 An active member in Kittatinny Lodge is someone who is a currently registered Scout or Scouter in the Hawk Mountain Council with current dues paid. With active membership, you are entitled to attend all functions of the lodge appropriate for your honor level. It also entitles you to wear your OA flap. Technically, if you don’t pay your dues, you are not a member, and the flap should be removed from your uniform. I didn’t get a renewal card. What should I do to re-activate my membership? If you paid dues within the last year, first contact the membership committee to verify we have current contact information on you. We will want to make sure we have your correct BSA ID#, address, phone number, email address, and unit you are registered in. Members often forget to notify the Service Center and Lodge of address changes so our mailings don’t reach you. If your dues have lapsed (i.e. you have missed more than 1 year of paying dues), you will need to complete a Membership Reinstate Form (available on this web site or from the council office). You will need to complete all the information on the form, and send it in the mail or drop it off at the Council Service Center or the Camp Office/Trading Post with the $15 membership fee. NOTE: If you are a “Youth+” (a Scouter aged 18-20 who is still considered a youth in the Order of the Arrow), please make sure you have completed your BSA Youth Protection Training. If you do not complete this training and keep it current, you will be dropped from the rolls of the BSA, and therefore from the rolls of the O.A. Lodge. If you have moved, changed phone number, changed e-mail address, or need to update any other information you can do so by contacting membership@kittatinny5.org or submitting the change online using the Change of Address form.